For April Brown and Sarah Sklash, becoming moteliers wasn't part of the roadmap. The two friends met at the University of Western Ontario, and post-college, Brown went into PR and marketing while Sklash worked for the provincial government. 15 years later, the duo felt like they needed a change: "Sarah and I were looking for that next chapter in both our careers and personal lives. The daily grind in Toronto was no longer as fulfilling as it once was when we were in our early twenties. We started to dream about having something of our own, a new creative outlet," explains Brown. 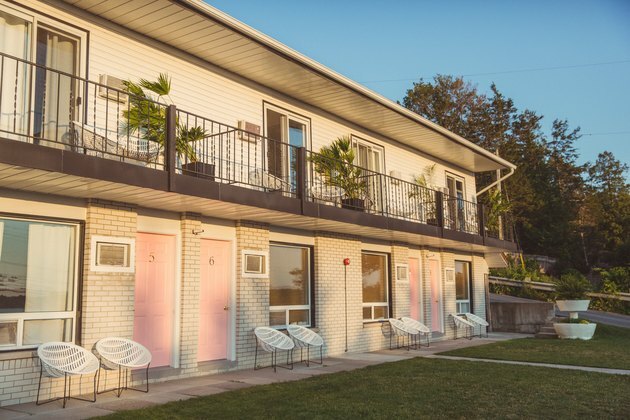 They put their heads together, and when a midcentury motor lodge in Canada's Prince Edward County came up for sale, something clicked. The result is The June Motel, a 16-room boutique stay they opened last year. 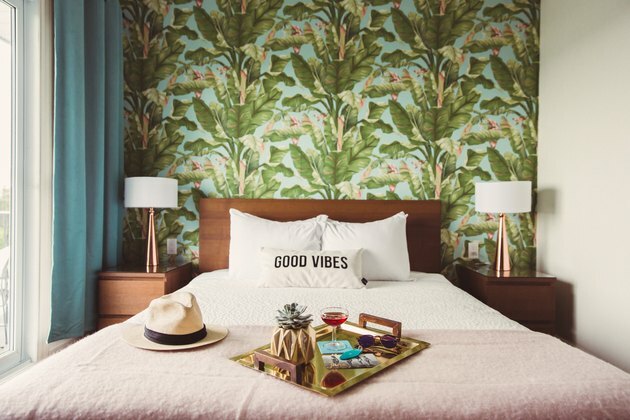 In transforming the original hotel's outdated, drab decor into the Instagrammable beauty it is now, Brown and Sklash still wanted to retain a vintage vibe. Throwback California — including roadside motels, just like this property's first chapter — guided their vision. "We were inspired by the glamour and charm of the motels in the '60s, so I really wanted to bring that era to life in a contemporary fashion," says Keri MacLellan of Four Walls, who designed the lobby. 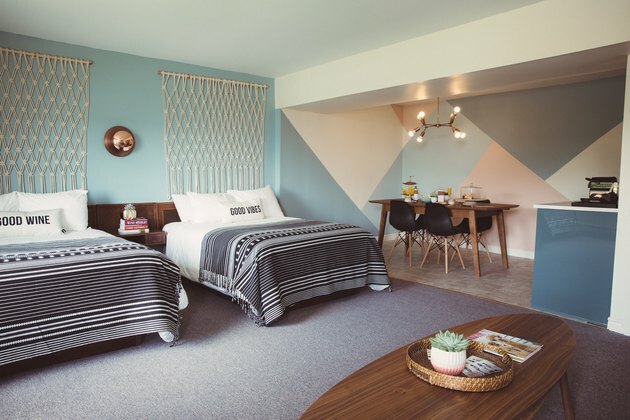 "In places like...Palm Springs the motel revival is in full swing, so we definitely pulled in a lot of that 1950s California feel." 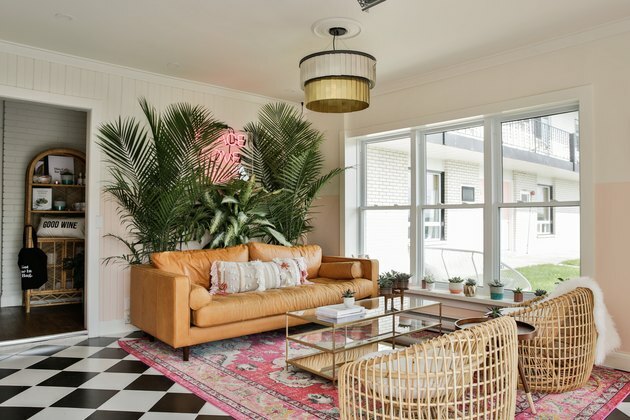 The result is a brilliant combination of old and new: "It's retro, but in a stylish and modern way, and features bohemian touches through handmade macramés and vintage peacock chairs in the rooms," says MacLellan. "We worked with a mix of designers and local makers to create The June," says Brown. "It was several months of sourcing the perfect mix of high and low pieces." That includes the ideal petal-pink shade for the room doors. "We want our guests to feel like they've just arrived at a friend's house for the weekend. We immediately pour them a glass of local rosé and chat about their plans during their stay," says Sklash. Along with a friendly welcome, the lobby's bohemian decor truly sets the hotel's vibe: "Some of our favorite pieces are the bohemian rattan chairs in the lobby sourced all the way from Denmark from Cane-Line, and our camel leather couch from Article.com has been a favorite," says Brown. Brown and Sklash worked with Swell Made Co. to create custom pillows for the beds. 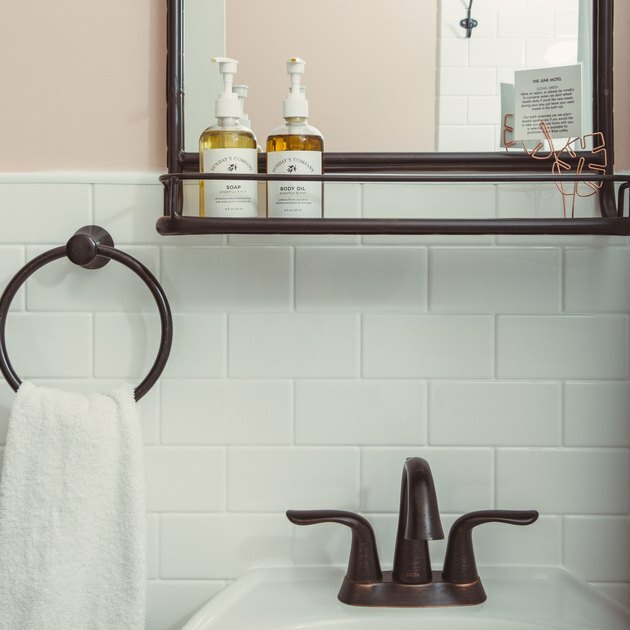 "What's really cool is that we just launched our online shop, so guests can shop various pieces in their room during their stay, including lamps, pillows, bath amenities, and more," says Brown. "Knowing millennials are social-media obsessed, we knew we had to pay extra attention to those statement pieces. 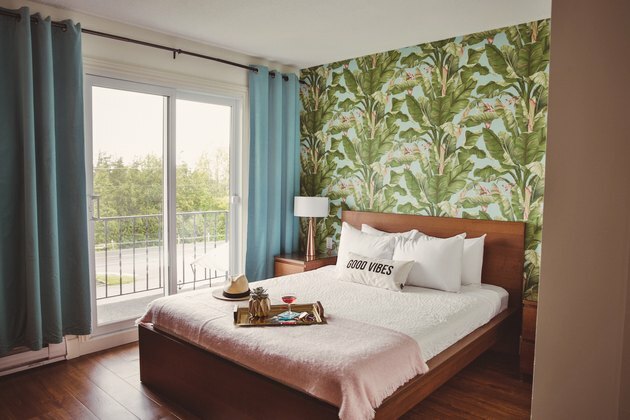 The pink doors when you arrive, neon sign in the lobby, and statement wallpaper in the rooms are all designed to be 'photo moments,'" says MacLellan. This is what The June calls their "Deluxe Wine Studio," which comes with a kitchenette stocked with local wines. 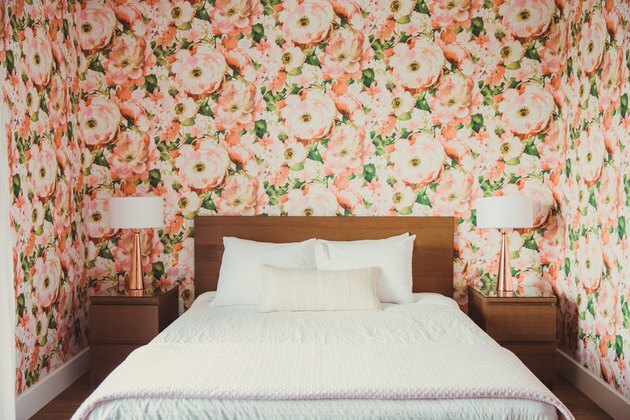 In the "Classic" rooms, you'll find delightful patterned wallpaper and a private balcony. In-room amenities were created by Sunday's Company, a nearby apothecary that relies on local plant ingredients.